Not that any of you across the pond have been waiting for this or anything, but if you haven’t seen it yet you might want to head over to Apple UK and checkout the main graphic. Thanks to listener Jeremy for the tip off. Express Your Creativity, Use Office? Ok, Microsoft is not the first company you think of when you think creative, artistic, or avant-garde. They also tend not to be too trendy or hip. Well, the folks over at the Microsoft Mac Businiess Unit (Mac BU) seem to want to try and up old Mr. Softies’ cool factor. To that end, they have created a new “social” networking site to showcase the more creative side of Office for Mac. The new Art of Office site is an online community where users can go, share, view, and download some of the most unusual (and I have to admit, somewhat cool) Office .doc, .xls, and .ppt files I have ever seen. The site has a nice web 2-oish look and feel and it might just change your thoughts on what you can do with a spreadsheet. The Mac BU says they, “wanted to give Mac users an outlet to showcase (their) creativity and passion”. Now, I’m not sure I believe we are all suddenly going to drop Photoshop and FinalCut for PowerPoint and Word, but I will give the BU props for their efforts. They are at least trying to “Think Different” and make Office more appealing (or at least interesting) to a Mac crowd. The site is definitely worth a look and I have to say I was impressed by some of the things I saw there. Check it out for yourself at http://www.artofoffice.com/. Who knows, maybe you can be the next Van Gough of Microsoft Word. Email alerts for things like drive failure, overheating, etc. All in all I’ve been very pleased with the device. It’s comforting to know that my family videos and pictures, as well as my digital music and important documents are being stored safely. It’s not bullet-proof, but honestly, you could ramble on forever in perinoia over backups if you let yourself. 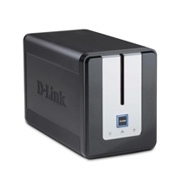 This offers a relatively low cost & simple solution to data backup. It runs the EXT2 file system and does not support NTFS – so don’t plan on using something like this in a Windows business environment where you need to set specific user permissions. The device, however, does support embedded user accounts that you can setup and manage from the web interface. Editors note: I received an email from a listener in Japan who uses this also and had a note for any international listeners who may be dependent on a solution with double-byte character support. A podcast about all things Macintosh. For Mac geeks, by Mac geeks. Show 197. New iTunes rivals surface. iPhone Update 1.0.2. iPhones unlocked in hardware and software. New iPods September 5th? Apple slow to patch JAVA bug. iPhone dead spots correction. Correction on Tiger Cache Cleaner. Buying a video camera. Migrating from PPC to Intel. Re-installing Mac Bundled iLife. I have something to say: Logic updates. Saving iWeb shared Web Gallery photos. Sending SMS in iChat. 200th show coming and I’m giving gifts. New music, Looking Back by Cruelty Free [buy]. I just saw this on the Fake Steve Jobs web site. Looks like Microsoft has a Flash header on their Microsoft Exchange Server 2007 page. In the image a streamer flows through displaying different words at random. One of the words is “viruses” and other is “built-in” so at the right moments it will actually read “viruses built-in” or “built-in viruses” (see above). Too hilarious. See it for yourself. AT&T… You do love trees, you really, really do. Ok. Reality is, this is likely more about not having to pay $7.95 postage every time they mail a customer a bill; but at least the trees benefit too. AT&T free msg: We are simplifying your paper bill, removing itemized detail. To view all detail go to att.com/mywireless. Still need a full paper bill? Call 611. So kudos to AT&T for responding to this issue fairly quickly. Question is, why wasn’t this problem thought of ahead of time? Oh well, welcome to big business in America. A podcast about all things Macintosh. For Mac geeks, by Mac geeks. Show 196. Next gen Intel Xeons on the way. Apple retires Appleworks, or have they? Jobs ups share count. iPhone Europe just weeks away? iPhone battery lawsuits, please. Lennon 3rd Beatle on iTunes iWeb 2.0.1 Update. Woz linked with Kathy Griffin. iLife ’08 font issues resolved. What are vintage and obsolete products? 802.11 lowest common denominator limitation. Capturing audio from difficult sources. Cleaning up your caches. 200th show coming, I’m giving the gifts. Take a look at this. 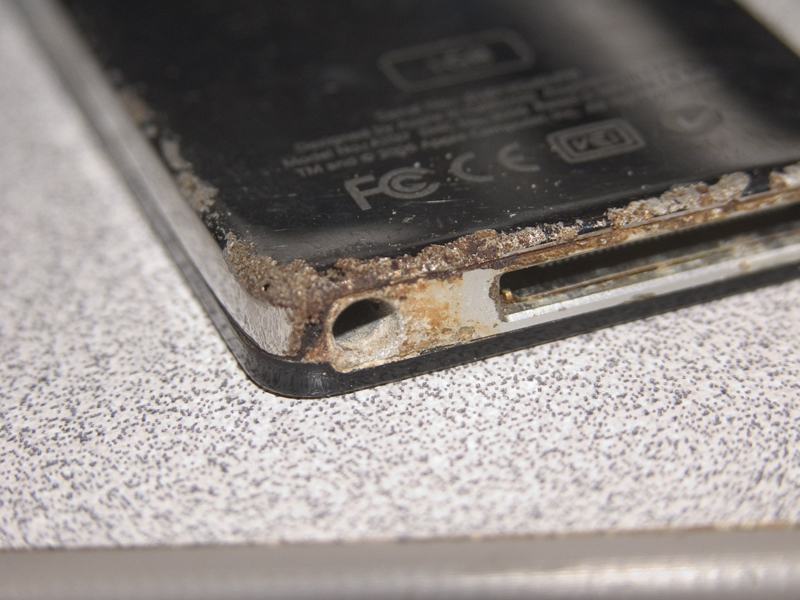 Listener Bryan has an iPod Nano that is less than a year old and has developed some serious pitting and corrosion along the bottom near the dock connector and headphone jack. The iPod has never had direct contact with water, but Bryan is a runner. He uses the iPod while exercising and has it in a Belkin Sport Sleeve while he’s running. The best guess is that the damage has been caused by sweat. From the picture it looks like the unit is one of the original iPod Nano’s and not one of the current models that have the anodizing. I assume the newer model would be more immune to this kind of problem, but would love to know your experiences. Have you experienced any damage like this with your iPod? This unit died a few days after talking with Adam. After a run of course. A podcast about all things Macintosh. For Mac geeks, by Mac geeks. Show 195. A couple bumps in the iPhone road. Universal DRM-free, not on iTunes. Software update onslaught continues. New iPhone ads. 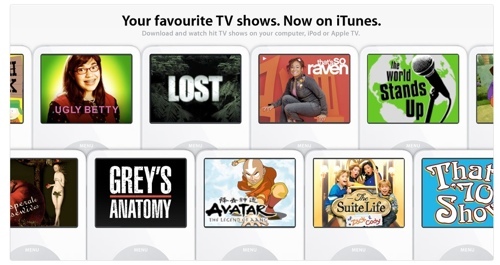 iTunes TV and Movies finally cross the pond? Giving ClarisWorks credit where it’s due. Maccast One Minute Tip – Customize Toolbar. Some things to know about the new iLife. Something to say… Missile Launching Macs. Maccast RSS Screen Saver. iDisk gets bigger, your HD gets smaller. iPhoto to manage photos the Apple way.